Hundreds of thousands of people have turned out in Sri Lankan capital Colombo to see Pope Francis celebrate a Mass at which he canonized the nation’s first saint, Joseph Vaz. Pope Francis urged people to follow the example of 17th Century missionary Joseph Vaz at the service in Colombo. On January 13, the pontiff called for the “pursuit of truth” to promote “justice, healing and unity” after years of war. Government forces defeated Tamil rebels in 2009 after 26 years of war, in which both sides were accused of atrocities. Pope Francis arrived early for the Mass on January 14, informally greeting worshippers. People showed up for the sea-front service at Galle Face Green, with many lining up from Tuesday to secure a place. 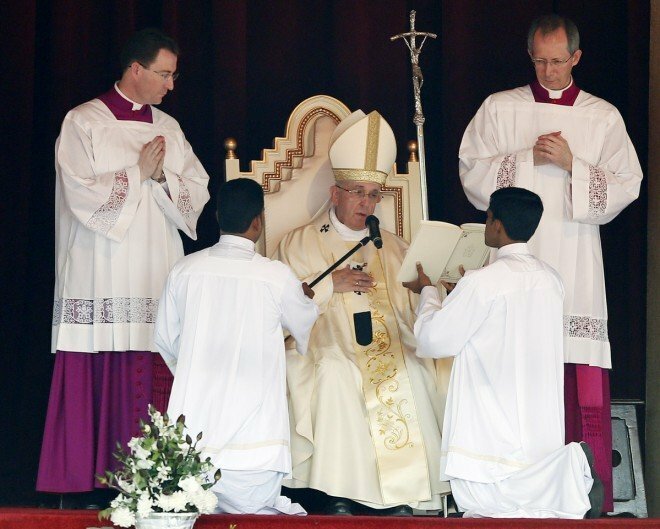 In keeping with his message of unity for Sri Lanka, Pope Francis urged its citizens to follow the example of Joseph Vaz and learn to overcome religious differences. The Pope said St Joseph dedicated his life to the gospel message of reconciliation, and showed “the importance of transcending religious divisions in the service of peace”. “Religious freedom is a fundamental human right. Each individual must be free alone or in association with others to seek the truth and to openly express his or her religious conviction,” Pope Francis said. The Church usually stipulates a potential saint must have two miracles attributed to them, but St Joseph has apparently been fast-tracked. Joseph Vaz is credited with just one miracle, whereby a pregnant Indian woman who was told that her baby was in danger prayed to St Joseph and the child was saved. There has been a great deal of enthusiasm for Joseph Vaz’s sainthood, not just from the Catholic community of Sri Lanka but also from India’s Catholic community. Pilgrims came from all over Sri Lanka, and parts of India, to see Pope Francis. However, some Buddhist activists have objected to the canonization and complain that the Catholic Church’s violent campaigns during its early years led to the destruction of Buddhist temples. Pope Francis’ visit is part of a six-day tour of Asia which will also see him visiting the Philippines. Later on Wednesday Pope Francis will speak at prayers in Madhu in the north, a region which saw some of the fiercest fighting in the war. The conflict arose from ethnic tensions between the majority Sinhalese and the Tamil minority. The United Nations said both sides committed atrocities against civilians and has approved a war-crimes inquiry. Sri Lanka has so far refused to co-operate. More than one million Sri Lankans (about 7%) are said to be Christian, most of them Catholic. They include both Sinhalese and Tamils. About 70% of Sri Lankans are Buddhist, with 13% Hindus and 10% Muslims. The last papal visit was 20 years ago, when Pope John Paul II was boycotted by Buddhist leaders. However, on January 13, Pope Francis met a group of Buddhist, Hindu and Muslim leaders, urging reconciliation.